St Patrick’s Day statistics and trends. 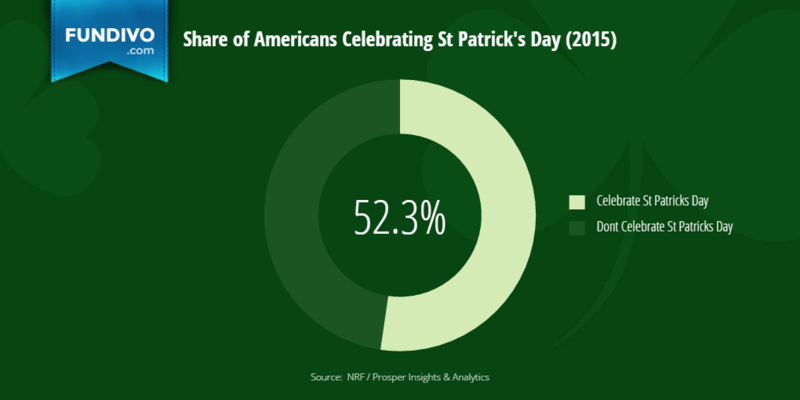 Discover facts and trends about St. Patrick’s Day, with consumer behavior and historical statistics about the day when millions of people wear green and celebrate the Irish. Total spent on St. Patrick's Day 2015 in U.S. 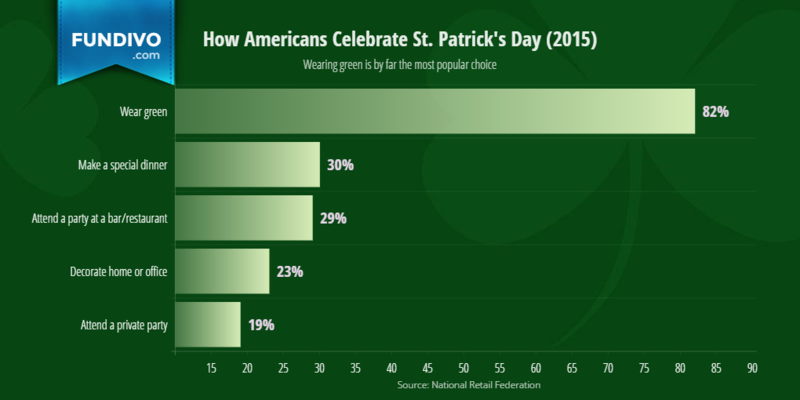 This chart shows the percentage of Americans (18+) who planned to celebrate St. Patrick’s Day in 2015 and is based on a survey conducted by the National Retail Federation. As you can see from the graph, about 127 million American adults (52.3%) were expected to take part in the Irish Holiday festivities in 2015, while 116 million (47.7%) didn’t plan to. The chart reveals the percentage of Americans who celebrate St. Patrick’s Day by age group. It clearly shows that St. Paddy’s Day is a popular holiday for younger people and millennials. In 2015, young adults age 18-24 did the most celebrating (73%), closely followed by 25 to 34 year olds (68%). 1 in 2 of those between the age of 45 and 54 marked the occasion last year, while only a third of seniors 65+ did. 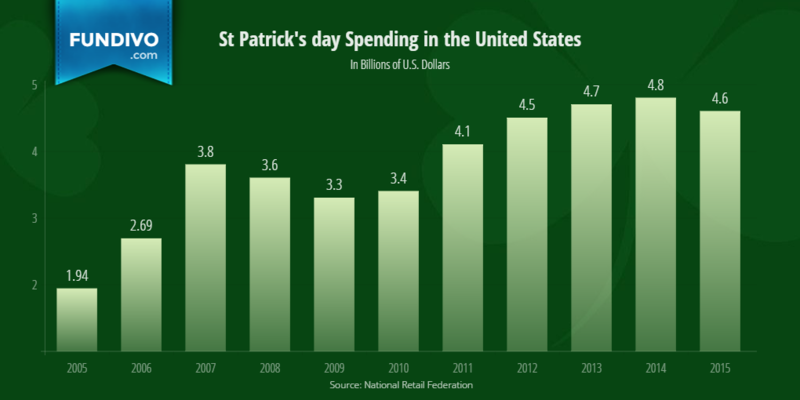 This graph showcases the historical trend in total St Patrick’s day spending in the United States since 2005. For 2015 Americans planned to spend $4.6 billion, down from the record $4.8 billion they planned to spend in 2014. 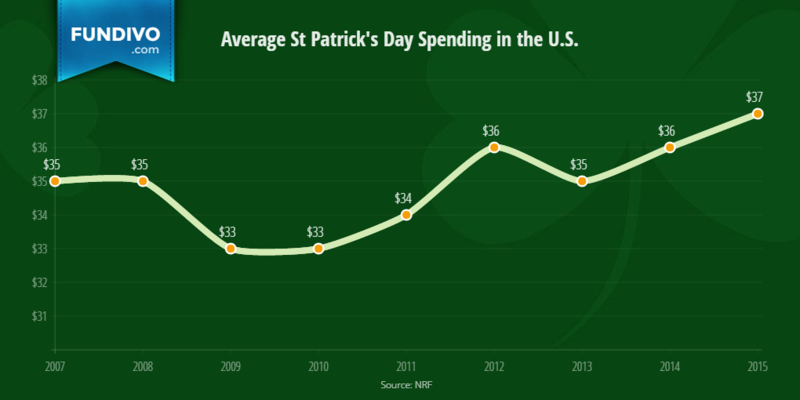 Since 2005, St Paddy’s day spending has more than doubled and has over the same period averaged about $3.8 billion. The chart above is based on results of a survey among adult Americans regarding how much money they plan to spend on St. Patrick’s day celebrations. In 2015, the average person expected to shell out $37, which is slightly higher than the average amount spent the previous year ($36), and also higher than the median $35 recorded since 2007. Understandably, the average spending took a big hit in 2009, mainly due to the Great Recession. 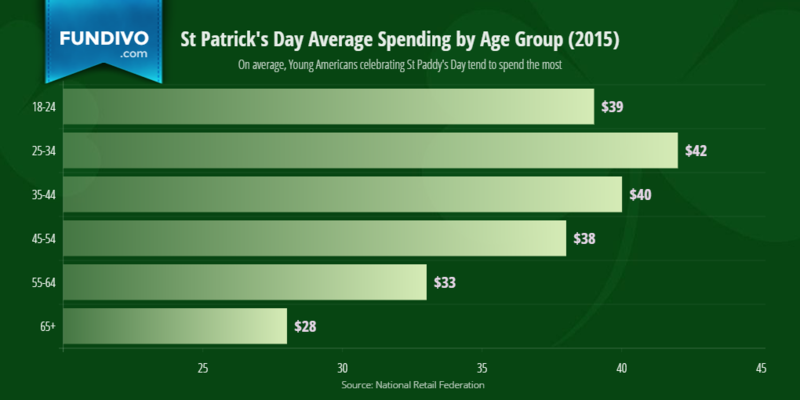 The chart above breaks down average St Patrick’s day spending by age group. 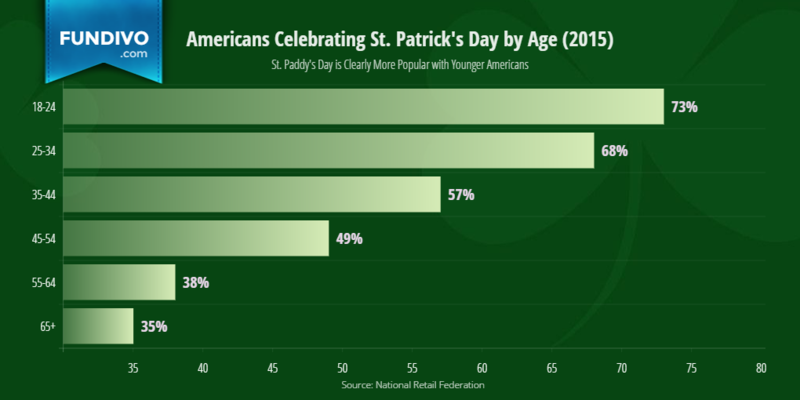 It clearly shows that young adults, and particularly the 25 to 34 year-olds, are a key demographic as they planned to spend an average of $42 on St. Paddy’s Day celebrations in 2015, which is a third more than the amount adults 65 and older ($28). 35 to 44 year olds come in second place, with an average spend of $40; followed closely by 18-24 year olds ($39). The graph above gives a detailed image on how people in the United States celebrated St. Patrick’s Day in 2015. It comes as no surprise that the overwhelming majority (82%) chose to wear green, a symbol of Irish culture. About a third marked the occasion by either joining a party at a bar/restaurant with their friends or by making a special dinner; while 1 in 5 planned to attend a private party.